BIBLIOMYSTERIES is a fun and worthy anthology. 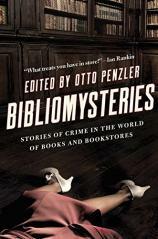 Commissioned by Otto Penzler’s world-renowned Mysterious Bookshop, and edited by The Man himself, it is a gathering between covers of 15 crime stories concerning books, bookstores, authors, owners and patrons. It is as solid a collection as you are likely to read this year. All of these tales have appeared elsewhere during the period of 2011 through 2013. Regardless of how well read you may be, you are sure to find stories and authors you have not previously encountered. The biggest surprise for me was a story by William Link featuring Columbo, the iconic television detective whose rumpled appearance and quirky mannerisms belied a keen intelligence and a mastery of what we would now call data pattern recognition. “Death Leaves a Bookmark” was part of a collection of 10 Columbo stories written by Link (who co-created the character) and, as with the television series, lets the reader witness the murder and watch the raincoat-clad lieutenant ferret out the killer. "Fifteen great stories. Over 500 pages. BIBLIOMYSTERIES will keep you busy and happy reading about your favorite thing. What’s not to love?" Loren D. Estleman provides another surprise with “Book Club.” I expected Amos Walker in Detroit, but instead was treated to Avery Sharecross (what a terrific name) in Good Advice, New Mexico. Sharecross is a retired detective who runs a bookstore in the crossroads town and is pressed into service when a local bibliophile is murdered with one of his own volumes. Books as murder weapons are also featured --- or are they? --- in Jeffery Deaver’s twisty “An Acceptable Sacrifice,” in which an unlikely pair of killers plot the assassination of a successful Mexican businessman who may or may not be a cartel leader planning a terrorist attack on a tourist bus. Subtle metaphors abound, as do surprises. Libraries --- where would we be without them? --- are also prominently featured in BIBLIOMYSTERIES. John Connolly isn’t his usual frightening self in “The Caxton Lending Library & Book Depository” but...well, actually, he is frightening in one spot, within a single understated sentence in which the resident of a small village discovers a library consisting of rare books and first editions, and a residence of sorts. It’s a wonderfully imagined and exquisitely executed tale. Andrew Taylor, a multiply honored crime novelist, also features a library --- the London Library --- as a very important backdrop to “The Long Sonata of the Dead.” It’s a tale of heartbreak, envy, revenge and betrayal, effortlessly contained in 25 pages or so with a description of the aforementioned London Library, which will make you want to drop everything and journey to that legendary city just to spend days wandering through its rooms. With stories like these --- and an editor like Penzler --- it’s difficult to pick favorites, and everyone’s will differ. For me --- in addition to “The Long Sonata of the Dead” and “An Acceptable Sacrifice” --- I was drawn to “It’s in the Book,” a Mike Hammer short story that began life as a story fragment by Mickey Spillane, which was then completed by Max Allan Collins. One would not necessarily equate Spillane’s iconic character with a passion for classic literature, but Collins makes the connection in a story where a mobster’s death sets off a mad hunt for his ledger, which is reputed to have information that will bring down criminals, police departments and governments, as well as cause danger to a pair of innocents. It’s up to Hammer to make everyone happy --- or at least equally unhappy --- and protect those who need protecting. He does so in fine style and with a surprise ending. There are also standout stories from Laura Lippman (who describes a wonderful bookstore in Boston in “The Book Thing”), Ken Bruen, Peter Blauner, Nelson DeMille, Reed Farrel Coleman, Anne Perry, David Bell and Thomas H. Cook. Oh, and my favorite title (and another of my favorite stories) --- “Pronghorns of the Third Reich” by C. J. Box --- is included here as well. Fifteen great stories. Over 500 pages. BIBLIOMYSTERIES will keep you busy and happy reading about your favorite thing. What’s not to love?